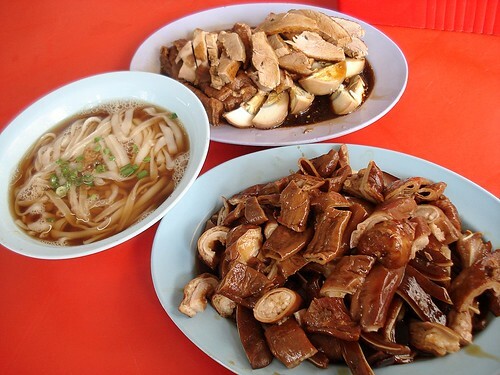 Kway Chap - intestines and pig's ears (front), braised duck, egg and tofu (back) and rice noodles in broth (middle) , originally uploaded by Camemberu. Just back from visiting the folks in Malaysia. I finally got to eat what I long regarded as "best kway chap ever" in Batu Pahat. My dad and I loooove kway chap! They also serve braised duck, which you can have with rice or noodles. 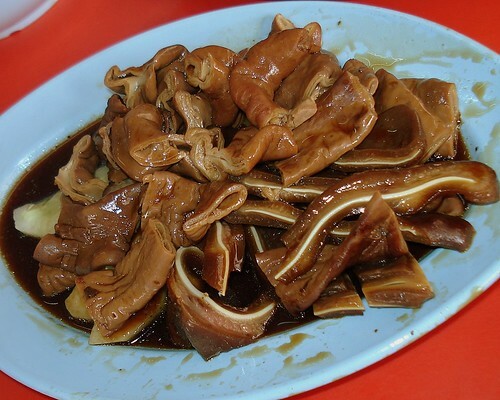 Another platter of kway chap, originally uploaded by Camemberu. Piggy parts and innards are braised for a long time until the flavour completely permeates the meat. 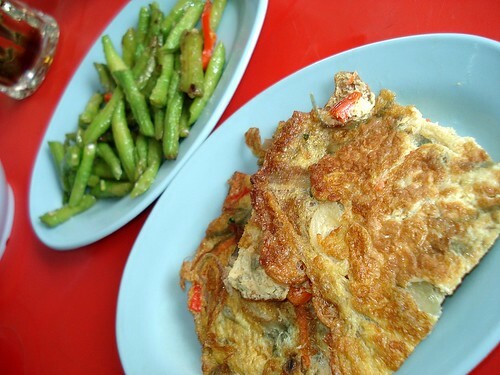 Hearty, robust and full-flavoured, it tastes slightly different from what you often get in Singapore. I think they use more dark sauce in braising too. They also serve a small selection of pre-cooked dishes, originally uploaded by Camemberu. There is a limited number of side dishes (even chicken curry, I think) but most of these are a bit cold and greasy. 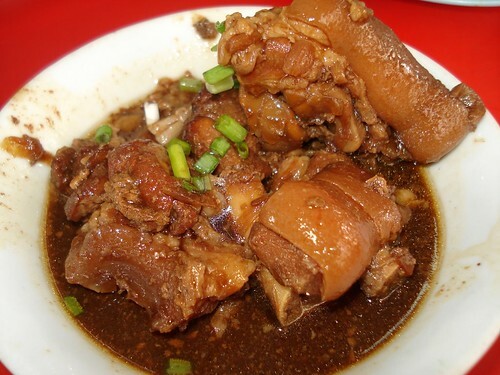 Braised Pig Trotters with Vinegar, originally uploaded by Camemberu. I did not know they had braised pork trotters in vinegar until today. A little too sweet and rich for my liking. 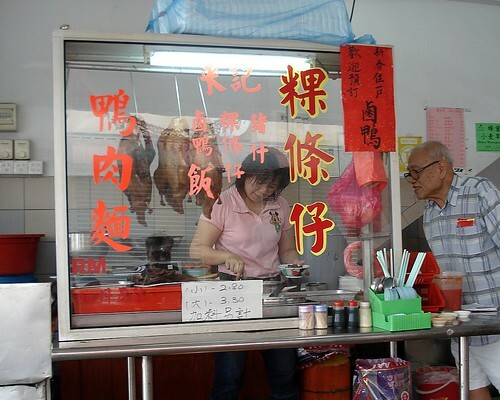 All the goodies come from this small stall inside Restoran K-10 , originally uploaded by Camemberu. This stall is apparently run by a Christian couple and they rest on Sundays. They only open for breakfast and lunch. Probably the rest of the day is spent cleaning and preparing the piggy entrails (it is a lot of work!). p.s. It's nomination day today in Malaysia (elections are coming!) and there are cars fitted with political party flags and banners (the way wedding cars are decorated) zipping around town! So funny when you see one chasing another. how does it compare to the kway chap opposite Carnival Hotel? Didn't know that there's another kway chap in town. Haha, we also walloped a lot - all the dishes you see here mainly eaten by me and my dad. My hubby had to sit this one out, he won't touch innards! That's why we went to KFC for him later on. The Mango Tree - One More Time! Google Ads - Bad Breath in a Food Blog? The Simple Life - Hawker Restaurant?